Gaming animals are rare, so we should treasure them. Especially on slow news days. "Cat playing Fruit Ninja" is Mack1094's first YouTube video, and it's already nearing 49,000 views. 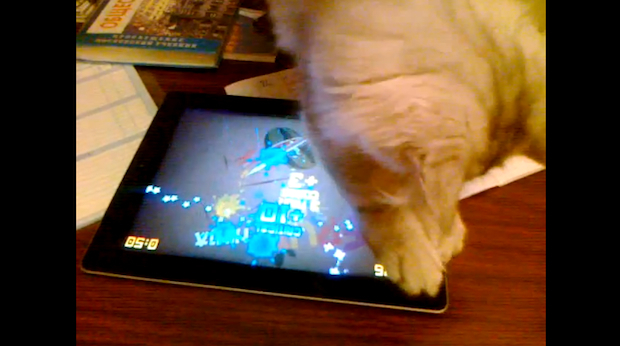 His adorable kitty is a pro at Fruit Ninja on the iPad. It's using the Double Claw technique to dispel those pesky watermelons. Watch closely: the cat is scarily accurate! I love how the game starts and the cat isn't looking. One glance and he's like DIE, FRUIT! After the jump you'll see another cat that likes slicing fruit. This one uses all four paws, and the moves to body slams.